The state government has allocated Rs 33 crore for the Ramzan festival, of which Rs 15 crore will be spent on Iftar feast, the Revenue Minister Mohammad Mahmood Ali told the officials.At the media conference on the occasion, the Deputy Chief Minister said that during the Ramzan Festival June 8, the Sub-Divisional Secretariat had ordered all the arrangements for the Iftar feast on behalf of the state government at the LB stadium. He said 500 gift packets (towers) were distributed to 800 mosques across the state. 400 mosques in the city and 400 mosques in different districts are offering these gift packs. He said that every mosque has been provided Rs one lakh for Iftar feast. After the formation of Telangana state, the budget for the welfare of minorities will be allocated to higher funding. He recalled that Telangana state is in the first place in all areas of the country. Iftar party guests should not have any difficulty in arranging all arrangements in the LB stadium, especially barricades, water supply and sanitation and temporary toilets. During the Iftar dinner, the power department has ordered the authorities to arrange the power without interruption. He also ordered police officials to make arrangements for parking and vehicle parking at LB stadium at chiefs and public officials participating in Iftar dinner. The Directorate of Information and Public Relations has directed the Ministry of Information and Broadcasting to set up LED screen screens along with the Public Address System at the LB Stadium at the Iftar Feast. 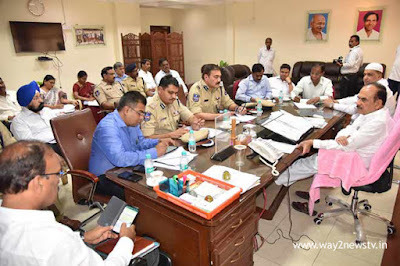 Hyderabad Deputy Collector has been appointed as a nodal officer for supervision of Iftar feast. The meeting was attended by Hyderabad District Collector Yogita Rana, GHMC Additional Commissioner Bharti Holikeri, Minority Welfare Department Director Shan Waz Qasim, Additional City Police Commissioner Jitender, R & B, ENSC Ganapathy Reddy Haj Committee Special Officer Professor S. Suukur Officers of various departments participated.